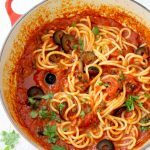 An authentic spaghetti alla Puttanesca Sauce recipe or Suggo all Puttanesca, made with anchovies, capers and black olives. 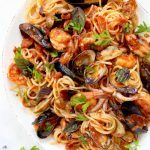 A favorite classic Italian pasta dish! So what is Puttanesca sauce or Suggo all Puttanesca ? 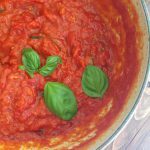 I like to think of it as a loaded Marinara or Arrabbiata sauce that you can make with fresh or canned San Marzano tomatoes. Saute lost of garlic, red pepper flakes and anchovies in a little olive oil. 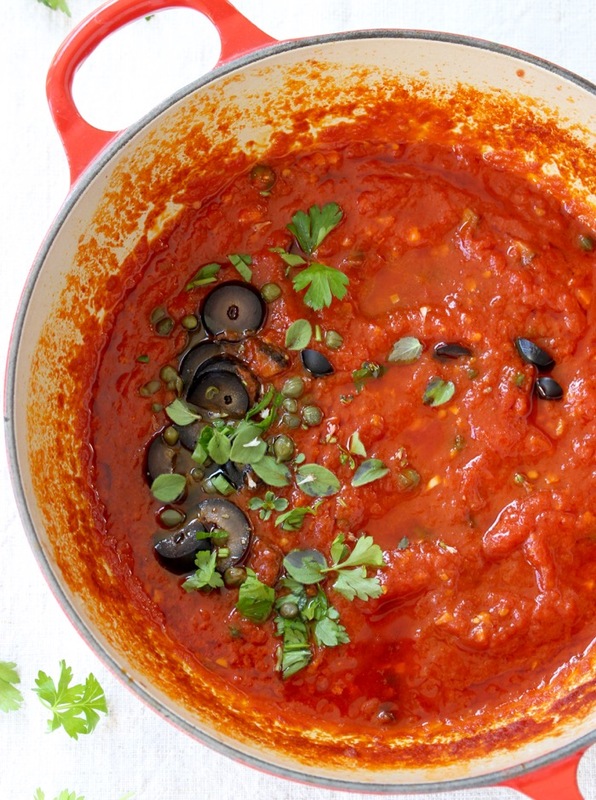 Add olives, tomatoes and oregano and cook them down into a hearty, thick sauce. 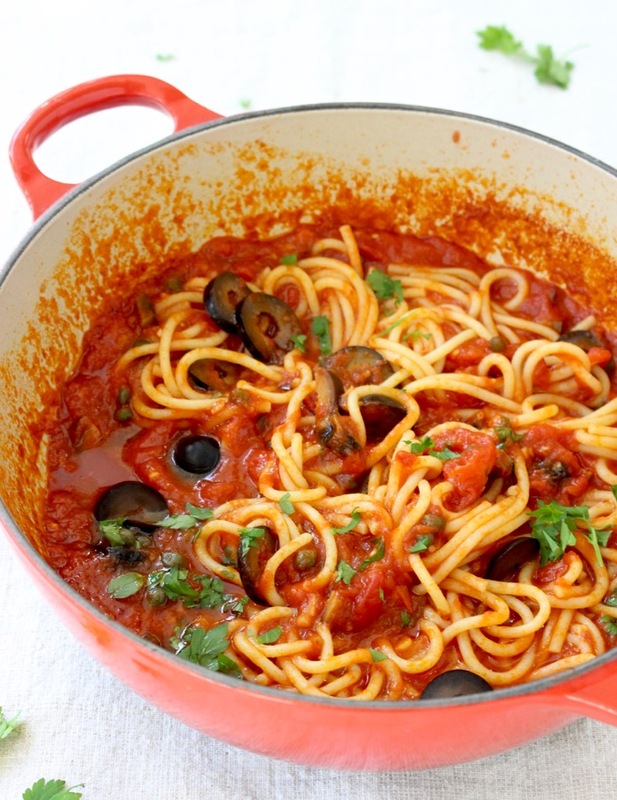 Toss with spaghetti and sprinkle with more olives and parsley. Clearly it doesn’t get much easier in the kitchen than making a pot of sauce to toss with pasta, right ? Yet you still have to keep an eye on it during cooking, as tomatoes have a lot of beautiful natural sugars that will burn easily If you walk away from it for too long without stirring, or if the flame is too high. Cook your sauce slowly, on low flame. Stir often with a wooden spoon so it doesn’t stick and burn. Make more than you need because you will want leftovers! 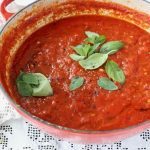 Easy Italian recipes are my favorite go to for my weeknight meals, but this classic puttanesca sauce is also worthy of gracing your dinner table for Sunday supper with the family. An authentic Puttanesca Sauce recipe or Suggo all Puttanesca, made with anchovies, capers and black olives. 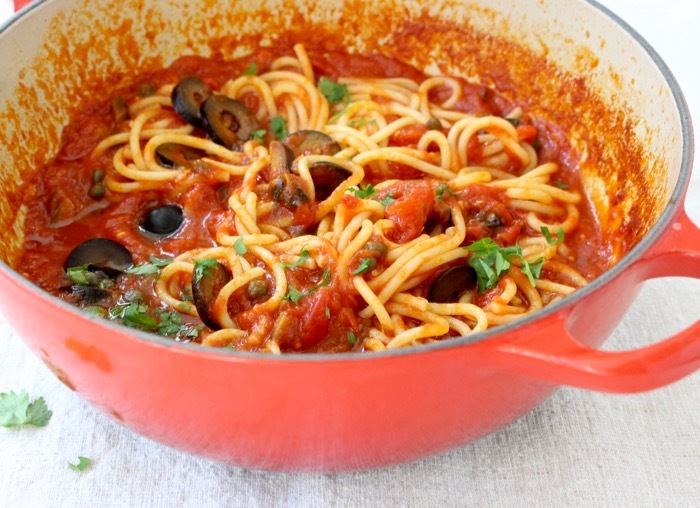 A favorite pasta dish of spaghetti alla Puttanesca. In a heavy bottom pot add a lug of olive oil over low flame. Add the anchovies and red pepper flakes to the olive oil and sauté for about two minutes until the anchovies start to melt into the oil. Stir in the garlic and stir well taking good care not to burn it. Add half of the black olives and the capers and cook for about 15 seconds or so. Use your hands to roughly crush the San Marzano tomatoes and add them to the pot together with the oregano. Stir well and bring to a gentle simmer. Partially cover the sauce with a lid and let it cook down for about 35 minutes until reduced and thickened to your liking. Stir often. Remove the sauce from flame and adjust seasonings to your taste with the sea salt. Meanwhile cook the spaghetti al dente and toss them with the puttanesca sauce. Serve hot, garnished with the remaining olives and fresh parsley. I used to make this sauce years ago and sort had sort of forgotten about it. Thanks for an updated version. Your pictures look delicious. 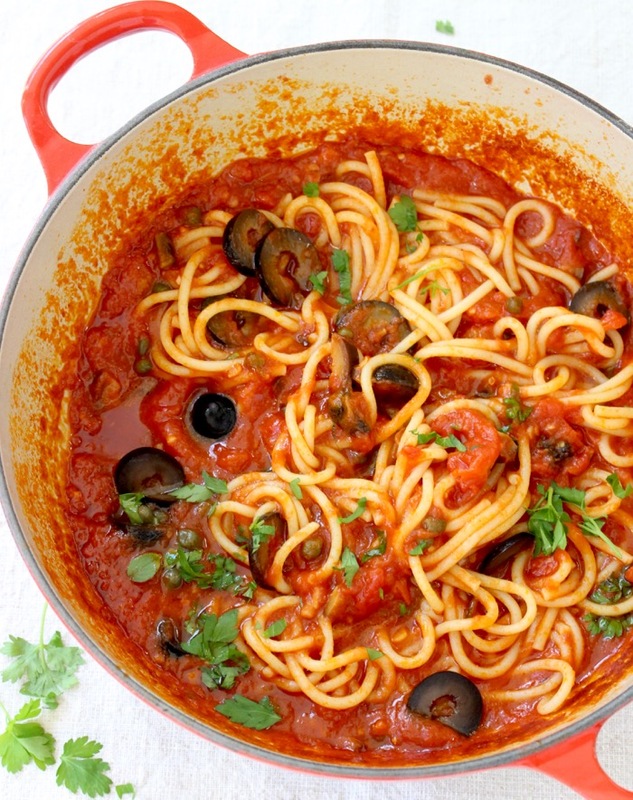 Spaghetti sauce just HAS to have olives in my opinion. This looks like some delicious comfort food. Such a perfect dinner meal! Nothing better then some classic pasta and great sauce! 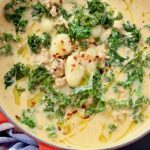 Ooh bookmarking this to make next week for dinner! Never heard of Puttanesca sauce until now. 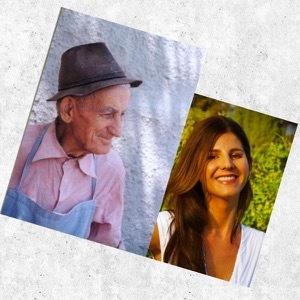 This is the best part about being into food blogging and networking.., you get to learn so much almost everyday. And coming back to the recipe, seems less complicated than the name itself. I will definitely give it a try. Thanks! Oh good grief does this look good! The Hubster is looking over my shoulder and just saying “want it!”. This will have to be on our dinner menu this week! YUM! Haha! Love your humor — and love this recipe! Yum. That looks so fresh and flavorful and YES, San Marzano’s are the best! This is one flavorful sauce! I’ve heard the story of the name before and I think it’s awesome! I need to make this! What a beautiful pasta dish! Thanks for the lesson! 😀 This looks so delicious! And easy. San Marzano tomatoes are the best! Love your recipe, and all those olives! Yum!! I love that this is so simple and one-pot, too!! Less mess to clean! Just made this with my sister and we both loved it. Even my 4 year old daughter enjoyed it. Will be made again and again. I have cooked this on many occasions … my own concoction 85% about 4****..
Now I think you have given me the real one …. so right, I use to skimp on the anchovies ..
Cant wait for the week end to give it a bash..